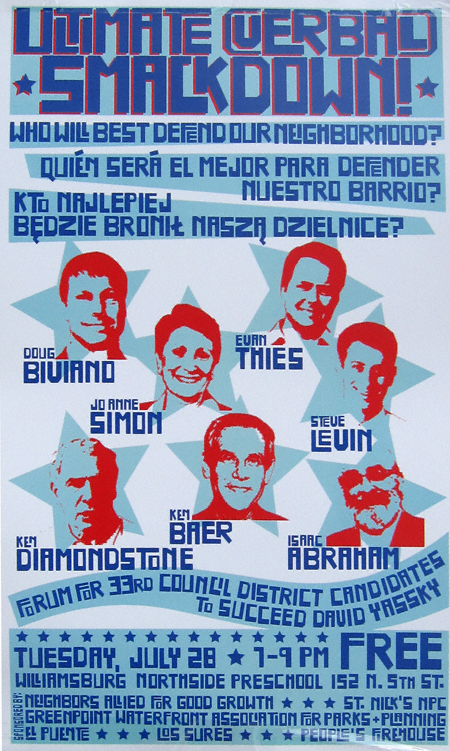 In a match held only once this century, seven City Council candidates will grapple with the issues important to North Brooklynites to help voters decide who will best be able to serve Greenpoint and Williamsburg in the City Council. Candidates will attempt their best verbal wrestling moves, although any metal chairs present will be for sitting and the only sleeper holds allowed are those that require a firm grasp of zoning law. It will probably be of interest to a number of people reading this that NAG is also taking submissions for a “people’s choice” question. You can tender your submission(s) and learn more about this event by clicking here. Tuesday, July 28, 2009; 7:00 – 9:00 p.m.
One Comment on TOMORROW: Smackdown! At first glance I thought it was “Ultimate Gerbil Smackdown”. But that is some nice art direction and typography! Big props to the designer.